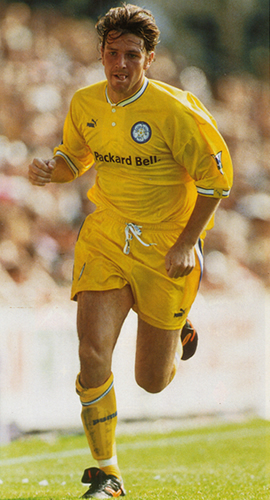 Asics’ tenure with Leeds United was short but memorable, however it wasn’t until the very end of the three-year stint that they provided a change kit in the classic Leeds format. From the early 1970s onwards, all-yellow with blue trim had become the favoured alternative, a status underlined by the Umbro kit worn in the Division 2 and then Division 1 title wins in 1990 and 1992 respectively. However, Asics provided yellow and blue stripes in 1993 and then, when a third kit was needed in 1994-95, green and a darker shade of blue was the choice. That was the kit worn at both Derby County and Bolton Wanderers in the third and fourth rounds of the FA Cup in 1996, but, after a draw at home with Port Vale in the fifth round, they appeared in something different at Vale Park for the replay on February 27. Identical in style to the home kit, barring the button neck rather than the crew-neck of the white shirt, it carried the classic ‘LUFC’ script on the left breast and a smaller version of the club crest above the Asics logo. It was worn against Port Vale as I believe players found it difficult to pick out team mates in the green/blue stripes during night games. Technically, the kit worn against Port Vale was a one-off – Leeds wore 1-11 in every cup game that season and this set had no names on the back. Another set, with names and squad numbers, was called into action twice, against Queens Park Rangers on March 6 and at Blackburn Rovers a week later. Those three games in the space of 15 days were the extent of the exposure for the yellow kit, which was never sold. In the summer of 1996, Puma replaced Asics and they had all-yellow as their first away strip.